Almonds in any form are nutritious, tasty and a handy pantry item. In addition to being a good source of protein and fiber, a 1 oz. serving — about 23 almonds — provides 35 percent of your daily vitamin E requirement, 20 percent of your daily magnesium requirement and additional minerals including phosphorous, calcium, iron and folate. 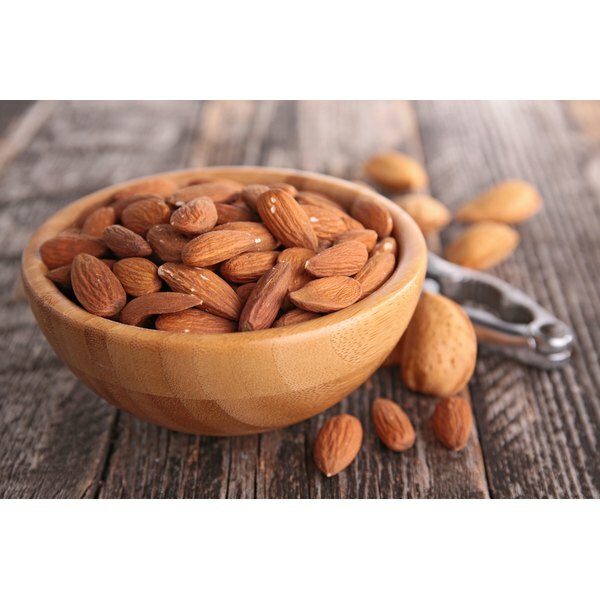 Storage can be a problem, however, as almonds are highly perishable due to their unsaturated fat content, dietitian Leslie Beck explains on her website. In general, think cool, dry and airtight when it comes to storing almonds. Pack almonds in vacuum-sealed or airtight containers such as plastic food containers, plastic food-storage bags or vacuum-seal bags. Protecting almonds from exposure to air is important not only to keep the nuts from becoming rancid but also to avoid having the almonds absorb odors from the atmosphere or other foods. Store almonds in a dark, cool environment at low levels of humidity, such as your refrigerator. Almonds keep well for up to two years if you store them at a temperature of lower than 40 degrees F and relative humidity levels of less than 65 percent, according to the Almond Board of California. Extend storage time to about four years by freezing almonds. Use airtight plastic freezer or vacuum bags rather than plastic containers to reduce the chance of ice-crystal formation and freezer burn. What Are the Dangers of Eating Raw Almonds?